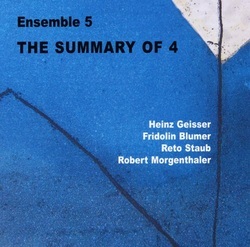 Ensemble 5 is a quartet, the 5 indicating the quartet itself and the synergy within which they all work. This synergy, as well as the freedom of the music is heard quite clearly in the seemingly ham-fisted rendering of the opening track, 'Layers', in which explosions from the trombone and the clattering scampering of the piano are driven and held together by the tremors of the bass and the thrashing on the drum, but there is never a drift away from the metre and through the album the solidity is constant. This coherence in what is very evidently a suite of freely improvised free jazz is impressive: it depends of course on a vivacious, aural structure, itself drawn from a breadth of musical lexis and expression. The title track, 'The Summary of 4' seems amorphous and vague, without the strength to pick itself up and go, yet it is all energy, whipping and shaking note by note in a cleverly raw but articulate and rational pandemonium. I recall from my youth in the very heady days of jazz on 78rpm singles, a recording by one Johnson (was it J.J. I wonder?) of completely solo trombone, perhaps from the 1930s? Weirdly different at the time and I am now reminded of it by Morgenthaler, especially on 'Here and Now'. It doesn't seem at all weird nowadays and indeed it isn't, but then as now I knew I was hearing free jazz, free improvisation and excitingly, though something quite new is being created each time, it is seldom without form.